This unique exhibition presents the launch of a vision through comic, multimedia and visual arts at those points where they intersect, interact and overlap – exposing the extremities behind control and illuminating an imaginative exploration of the future of surveillance and the systematic, ruthless misuse of technology. The responsiveness to the impact on people’s lives exercised by surveillance systems has been widely analyzed and examined from various points of view with a number of artists dedicating their work to the psychological and social implication of being part of a society ‘under control’. CCTVYLLE joins this debate, yet with a distinctive approach to the matter by focusing on the medium and technology utilized by surveillance systems in order to offer a new vision of a future advancing toward the greater consequences that far more sophisticated surveillance systems WILL bring. This multi-disciplinary exhibition features a selection of original large-scale drawings, comic, animation, video and sound work spanning 2 years developed by the CCTVYLLE Collective – including works fromCCTVYLLE founder, award-winner Gianluca Bonomo (Channel4 FourDocs, University of Arts London, Imogen Heap/Ellipse, 2010) and fellow collaborators Salvatore Porcaro (Bonelli Editors), Chanon Treenet (CosmoLeigh), Diego Blanda (VV Publisher), Natale Cracchiolo (Im*Media), and Sound partner Alex Smoke (Incommunicado, 2005 and Paradolia, 2006). The variety of work presents an intriguing balance between realism, stylization and interplay through fine art and comic models of representation. Whilst the comic and animation work offer a narrative key that opens the door to context and an already “expanding” notion around surveillance, the fine artworks depict a visionary interpretation of the possible manifestations of a future occupied with devices and animals intersected into one hybrid object. With orderliness echoing elements from fascist iconography, the extreme detail that flows throughout the exhibition stands proportional to the desire to discover and identify the specific nature, plausibility and variety of the represented subject matter. Each individual work is prominently not directly linked to the narrative elements of the comic, but more accurately present an artistic vision of a world from a possible future through diverse mediums. The exhibition additionally hosts the launch of the new comic bearing the same title CCTVYLLE : Prelude. This 21-page comic exposes a city turned into a sort of open-air prison, where people are constantly tracked and identified by a government-run organization in charge of an advanced and complex network of a futuristic surveillance system. The dramatic nature of both the comic and animation productions, fused with the fine artworks, criticize the psychological, political and ethical impacts that transpire in a not so distant future. Emphasized through the representation of futuristic devices and an imaginative scientific breakthrough, the advanced concept of CCTVYLLE explores the misuse of resources and power leading to the long-term consequences that could affect both individuals and society as a whole. This exhibition has been developed with Curator Alexa jeanne Kusber. 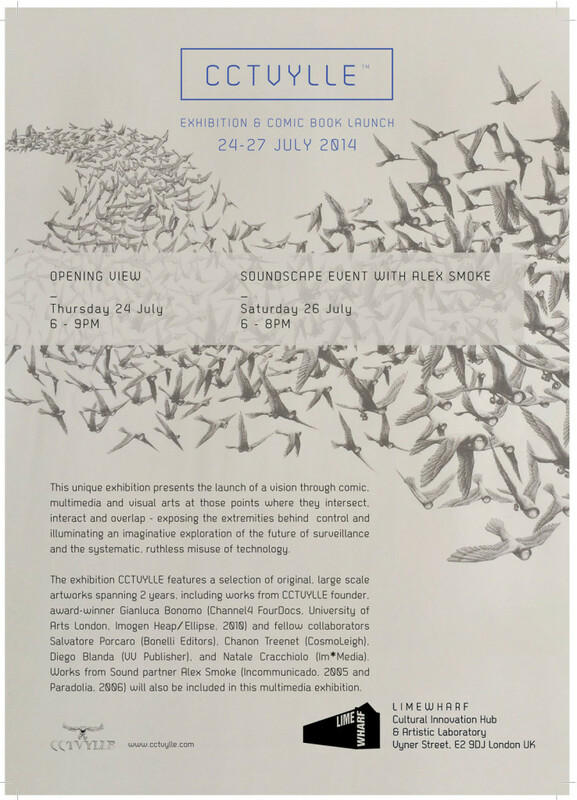 As part of the CCTVYLLE project launch at LIMEWHARF, an accompanying music event on 26 July will visualize the creative process through sound created by music producer Alex Smoke who is composing the soundtrackks of all the animation work presented (and still in production). LIMEWHARF is a Hackney based cultural innovation hub and artistic laboratory on Regent’s Canal. Located in the heart of East London’s creative quarter on Vyner Street, this innovative and experimental centre welcomes both artists and scientists to collaborate in residencies, think tank gatherings and stimulating exhibitions. For press inquiries, please contact Gianluca Bonomo at luca@cctvylle.com.